Waiting until the right moment to open, the right day to bloom, the right time to stand tall. Then again, we don’t always get to choose, do we? Sometimes, it all happens when we least expect it, the sun comes out, temperatures rise, flowers burst into blossom, petals age and wither. 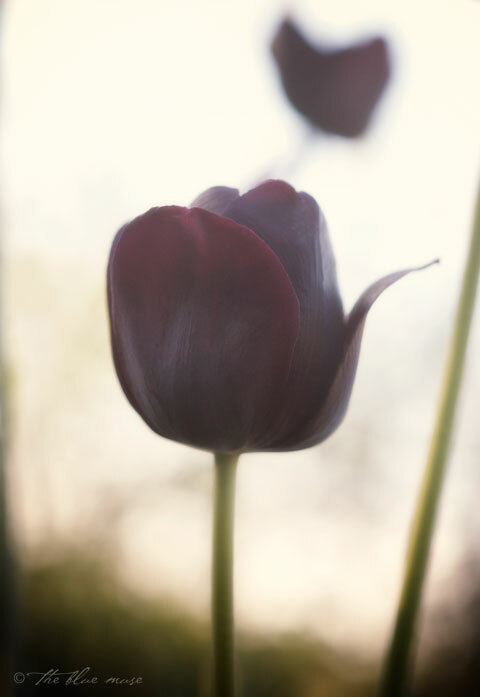 Tulips, like most other bulbs, can be forced. Give them a rest, a false winter, time and cold and then warmth and light, and they will believe their time has come. This isn’t a bad thing, this is why I can have tulips in a vase on my kitchen table all winter long. But tulips in the garden have to fight for their own survival, time it all just right, and hope that Mother Nature gives them a break. They have to have the patience and the perseverance and the luck to make it through. But then, when it happens, look how gorgeous. This entry was posted on Thursday, May 16th, 2013 at 9:01 amand is filed under . You can follow any responses to this entry through the RSS 2.0 feed. You can leave a response, or trackback from your own site. i just bought orange and yellow tulips for my kitchen. i always have fresh flowers in the house, because why not? i never thought about this before, the forcing of bulbs for blooms. suddenly i feel selfish, though the bulbs stay safe. suddenly i appreciate those bulbs that make it on their own just a bit more. kind of like people. smiles….everything has its time….and while we can force somethings it rarely turns out as good as if we just let it…. your words are so wise and beautiful, thank you for them. tulips and even (horrors! gasp!) dandelions make me smile in this ever slow coming spring. the farmer cringes at the dandelions but my heart smiles. tulips are a plus. It IS amazing how they survive and push up, despite the odds against them — squirels having a November munch, a too early thaw, age setting in. They ARE miracles, each and every bulb that blooms. Thanks for the gorgeous. your poem has opened my eyes wider to the wonder of life.